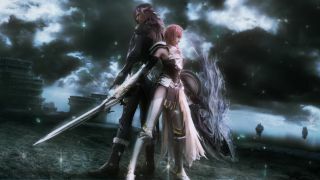 Final Fantasy XIII-2 PC has a release date. It was announced in a new trailer for the game's Steam version—a trailer that, soon after, was made private by Square Enix. If they do stand by the information the trailer contained, the game will reach PC on 11 December. The internet being the internet, the trailer has already been mirrored elsewhere. You can see it below. UPDATE: The official version is available once again. You can now find that below. You'll note, at the end, a claim of "new features and enhancements". With luck, it'll arrive in better shape than Final Fantasy XIII—the port of which was, as Sam notes in his review, something of a travesty. Whatever people's thoughts on XIII specifically, Final Fantasy is a massive series that deserves a little love. Final Fantasy XIII-2 will be available for £13.